Living in the city means you might not have the choicest of outdoor spaces. Forget sweeping fertile fields – what do you do with a small, sloped area with little or no soil? You build a rock garden, of course! Rock gardens are perfect for small, barren spaces because they welcome plants that are used to just such an environment and make for a different, but still brightly floral, use of space. Keep reading to learn about city rock garden design. Creating city rock gardens isn’t all that difficult. Emulating the rocky outcrops and scarce soil of mountain ridges above the tree line, rock gardens are the perfect home for alpine plants. Used to buffer winds, alpine plants grow close to the ground and are great if you don’t have much space for your garden to spread. Be aware, though: These flowers are all accustomed to mountaintops and, by extension, bright sunlight. If your urban rock garden receives full sun, plant away! If you’re in a very shady space, consider covering your rock garden with moss. A rock garden in the city works best in full sun and should have very good drainage. 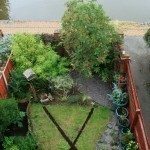 Try to avoid shady or damp areas. As you’re emulating a mountaintop, your city rock garden design will do best on a slope. It decreases shading, and it ensures better drainage. If no slope exists, build up a small one with your base layer. First, put out a coarse base layer of gravel or similarly-sized rubble. Cover it with a sheet of heavily-punctured plastic to make a stable base with free drainage. Arrange your rocks on top, preferably with a variety of shapes and sizes. Fill in the spaces between with garden soil and top with a mix of sand, compost, and loam. Now plant your flowers according to their needs.